Tray input of 3500 sheets enhances the multi-format 55-ppm MFP that already offers SRA3 (30.48 x 45.72 cm) output, copying, scanning, faxing and optional finishing. Colour output up to SRA3 (30.48 x 45.72 cm) makes a big impression, while additional paper trays allow A4/letter-size printing and a multipurpose feeder takes small envelopes. Among the wide range of media types accepted are card stock, glossy stock, recycled paper, transparencies and labels. Two 500-sheet trays plus a 2500-sheet feeder provide up to 3500 sheets of tray input, plus 150 sheets via the multipurpose feeder. 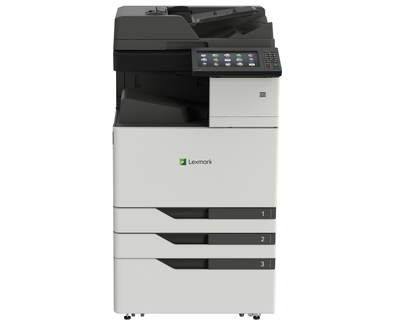 It’s a perfect match for genuine Lexmark toner cartridges that print up to 34,000 mono or colour pages, and fusers and developer units that go up to 720,000 and 600,000 pages, respectively.